There is no question that buying for baby’s everyday needs can get pretty expensive. Just yesterday I went grocery shopping and purchased almost 60 jars of baby food. 60! Adding diapers into the mix, which I also bought yesterday, the register total just kept climbing. We are basically a one income household so when I buy everyday essentials for the family, I do anything and everything I can to save money. Where I save the most money is by couponing and I always make time to browse for relevant savings. Whether it’s adding electronic coupons to a store card, printing online coupons, or clipping coupons from the Sunday paper, coupons are a really big help in sticking to my budget. And if there’s one type of coupon that I love the most, it’s diaper coupons. There’s no getting out of purchasing diapers, no matter how much they cost. And as far as diaper coupons go, I get really excited when they’re for diaper brands I love and trust, like Luvs. Contour to my little one’s curves and movements throughout her daily activities. Nice snug fit without compromising softness and comfort. Large, refastenable stretch tabs make for easy, yet secure fastening. Super Absorbent Leakguards and NightLock Plus lock away and absorb more wetness than regular Luvs, ensuring we both get a good night’s sleep. Luvs offers a Money Back Guarantee if at any point I’m dissatisfied with leakage protection. I save up to $150 annually, compared to other leading diaper brands, and this doesn’t include any additional coupon savings. Now for the exciting news! 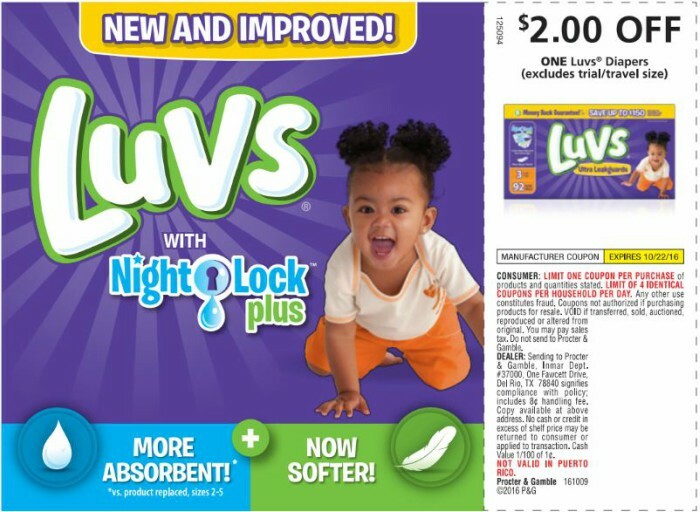 In the Sunday newspaper on September 25th, you can expect a $2 coupon valid on any one package of Luvs diapers. But that’s not all! Again on October 9th, there’s going to be another $2 coupon for the same thing! Woohoo! Bring on double the savings! The couponer in me is doing a little happy dance in anticipation of these newspapers coming. Many diaper coupons have restrictions as far as the size you have to purchase, but in this case the only restriction is that they can’t be used on trial/travel size. That means you can use these coupons on a large box of Luvs or even one of the smaller packages. And just a heads up, each coupon is valid for 2 weeks so don’t let them expire! I sure won’t! Do you have a little one who wears Luvs diapers? *Thank you to Luvs for sponsoring today’s post and helping me save on baby essentials. This is a sponsored post in which I will receive compensation. My opinions are 100% my own and in no way influenced by the brand. Any claims or statistics should be confirmed with the brand. Please see this blog’s full policies and disclosure here. Do not have any little ones that wear diapers anymore, but when my son was little Luvs was our number one choice for diapers. 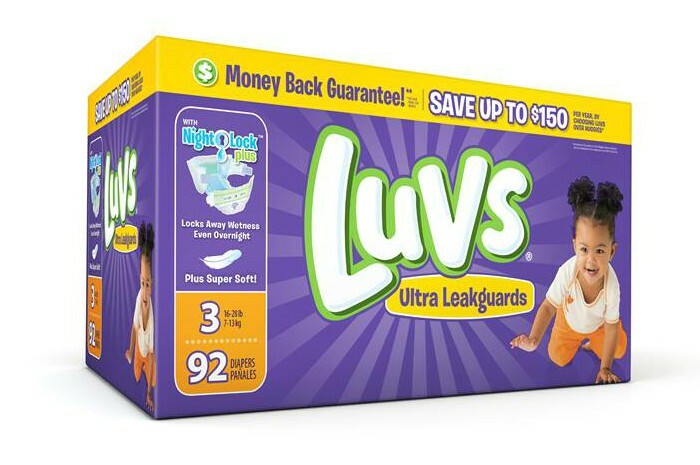 Luvs is definitely my favorite brand of diaper. Compared to others they just don’t leak as much over night. I don’t blame you for choosing Luvs diapers – great brand! My family has been trusting their name since I was a little baby! My niece’s mom uses Luvs because they are affordable and they work well. Luvs diapers are great! Now would be a really good time to stock up and the savings would help. Luv’s is a great brand of diapers. This is such a great deal. I will have to share this with my friends with little ones. My friend just found out she is going to have twins. I will have to tell her about Luv’s. I used Luv’s for my kids and was never disappointed. I always add a few packs to my baby shower gift baskets. Luvs is such a great diaper company. My kids are to old for diapers now but I will definitely be passing this on! I don’t know but I had two about a year ago. I loved finding savings like this too! Thanks for sharing your find. Bet lots of moms and dads with kids still in diapers are going to appreciate this post. 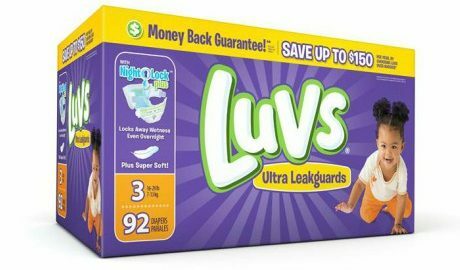 We always relied on Luvs and I remember them being lifesavers for keeping our kids lil Tushies leakproof all night long!! Great savings too! I love Luvs! Now would be a really good time to stock up and any savings would help. I am so happy we are down to only one in diapers. For the longest time we had two at a time. My daughter has been out of diapers for many years now. This looks like an amazing deal though. I have heard great things about Luvs diapers. We don’t carry them in Canada. Both my girls are older.